If you’re like me, you’re always on the lookout for snacks that are as tasty to eat as they are good for your health and diet. I’m always reading labels and doing my best to learn about what I’m putting in my body, and more importantly, what I’m putting in my family’s bodies, especially my kids. When I came across the opportunity to review Green Plate Foods, I was intrigued by their promise to be healthy, crave-worthy, affordable, and convenient – food traits I’m always impressed by! I received a sampler of Nubblers from Green Plate Foods for review. 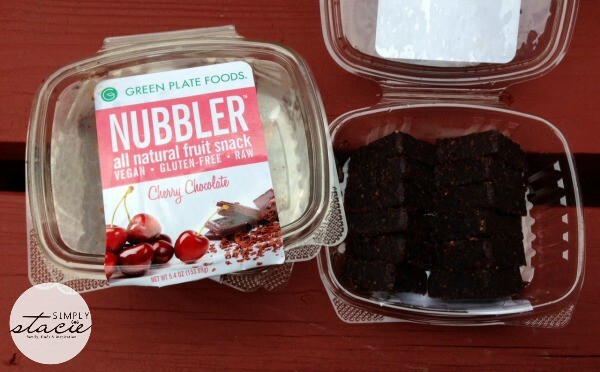 Nubblers are a raw, vegan, gluten-free, dried fruit snack. They are made with only 5 simple ingredients and are free of refined sugars, sodium, artificial flavorings and preservatives. 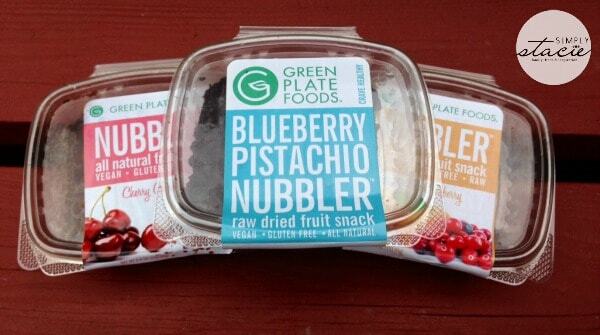 I received three flavors of Nubblers to try – Cherry Chocolate, Apricot Cranberry, and Blueberry Pistachio. Having a soft spot for anything chocolate, I tried the Cherry Chocolate flavor first. I cannot even begin to describe the absolute fantastic flavor of these snacks – the taste and texture are really incredible. These really satisfied my chocolate cravings – and what’s great is that one or two at a time are actually really filling, so you’ll feel full quickly with these healthy snacks as opposed to loading up on empty calories of other snacks. The Apricot Cranberry Nubblers have a great tart taste that you would expect from these fruits, and are really a tasty treat. The Blueberry Pistachio was equally as delicious as the other two flavors. I really can’t pick a favorite – I’ll take any of these flavors any time! These snacks would be just as great as part of an appetizer plate for guests as they would be straight out of the packaging as quick in-between meal snack. 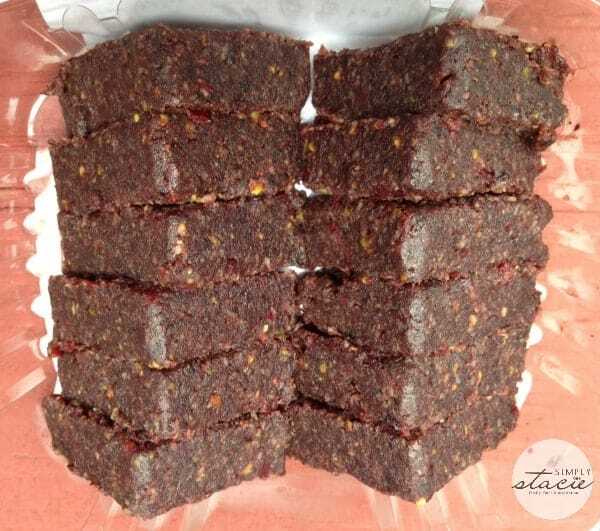 You can feel good about indulging in these, and you can feel good about offering them to your family and friends as well. A dozen Nubblers sells for $5 on the Green Plate Foods online store. Check out their retail locator to see if there’s a store near you that carries them. Green Plate Foods was founded by Lisa Pounds – a Houston mom and entrepreneur that is passionate about healthy eating and living, educating others about how important it is to consider what they’re putting in their bodies, and that healthy can be delicious. The Green Plate Foods mission is to create nutrient-rich snacks and meals that you, your friends, family, clients, and guests will love. They only source the highest quality clean and all natural ingredients for their products. Their recipes are created with a registered dietitian and many trained chefs. Besides the Nubblers, they also offer cookie dough, cookies, mini muffin batter, and mini muffins that are as wholesome and natural as their Nubblers are. To see everything that Green Plate Foods has to offer, check out their website. I love that they incorporate veggies into their treats. I love the gift ideas with the variety of products! If your neighborhood doesn’t have a recycling program, they will collect and recycle the empty containers for you. I learned that this is affordable. It took years for this woman to make healthy snacks and foods that taste delicious, but don’t cost an arm and a leg. She speaks about incorporating these meals and foods into schools and maybe nursing homes. What a great idea. I like the Super Brownie Muffins. I like the SUPER BROWNIE MINI MUFFIN BATTER. There’s no sodium. I’m trying to cut out as much of it as I can. Definitely like how I’ve never seen any kind of healthy fruity snack like this! Sounds really great! At Green Plate Foods, our mission is to create nutrient – rich snacks and meals that we know your friends, family, clients + guests will love! We only source the highest quality clean and all natural ingredients. Our recipes are created with our registered dietitian and many trained chefs. I learned they make tasty baked goods with spinach,squash and sweet potatoes purees. This sounds like a healthy option for my daughter! Thanks! I like that the company keeps its products affordable, so healthy food is more accessible to people. That’s an awesome philosophy for a company to have! I like their Dessert Platters – Cookies and Muffin Combo! Wow, fewer ingredients. Jammy bars sound so good. My daughter would approve. Their food is rich in nutrients.